Apples! It’s that time of the year again. Apple season is the unofficial start of fall in my book. A few weeks back my family went on an adventure. We journeyed to Arbor Day Farm, which is one of a few apple orchards in eastern Nebraska. Here you can walk the rows of apples trees picking your own apples as you please. This year we got 20 pounds worth of apples, and scored a free tree to plant! They also have interactive activities for kids and a nature trail! We try to take a trip there yearly. It is a nice break from the real world. Rachael enjoyed it so much this year she even wrote about it! Like I said, though we got 20 pounds of apples, which was 20 pounds more than I knew what to do with. I started thinking about apple butter, I was thinking about it so much I could actually taste it. Apple butter is something that I would get from a rural farm stand. My mom and I are the only members of my family who enjoyed apple butter growing up. Isn’t it crazy how one forgets those simple moments in life? So this last weekend I decided to embark on a voyage into the world of crockpots. My general view and usage of a crock pot is to keep my already cooked food warm. I honestly just love creating over the stove, or grill, or fire. Knowing that this would take some time to make, and I would be a 2 for 1 with the kids. I figured it was time to crock pot it up! This is my crock pot of choice it’s nothing fancy, but it does its job. This is a very simple recipe, but that’s what makes it so good. Throw it in crock combine and stir on occasion. Now when that lid comes off your house gets blasted with fall. Who needs a smelly candle when you can have the real thing. I love the smell of allspice and cloves. For this one I added a kick of cayenne, just to make things interesting. 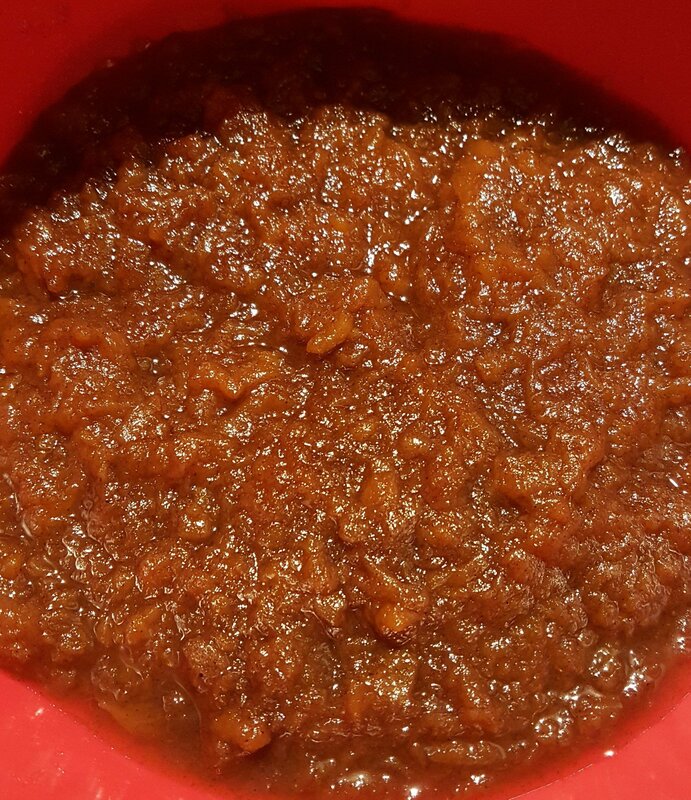 After 8 hours on low the apples are becoming mush and looks like caramel. It might need some help breaking down the left over chunks, some can be stubborn. I hit it with a stick blender to make it velvety, smooth finish, and a better mouth feel. This is a smaller batch recipe and is good for a month in the fridge. Combine all ingredients but apples in the bottom of a crock pot. Peel, core, and dice apples into the crock pot. Cook on low for 7 or 8 hours covered, stirring hourly. Break down chunks and let reduce uncovered for another hour. Smooth out texture with a stick blender. This recipe will yield about 20oz and will keep for about a month in the fridge.